12 The city wall was broad and high, with twelve gates guarded by twelve angels. And the names of the twelve tribes of Israel were written on the gates. 13 There were three gates on each side—east, north, south, and west. 14 The wall of the city had twelve foundation stones, and on them were written the names of the twelve apostles of the Lamb. There is a glow surrounding Jesus on the golden road bridge, which creates cast shadows behind the little Christian figures at his feet. The is a heavenly golden glow over the city, particularly concentrated in & around the large central building, which is something like a palace. 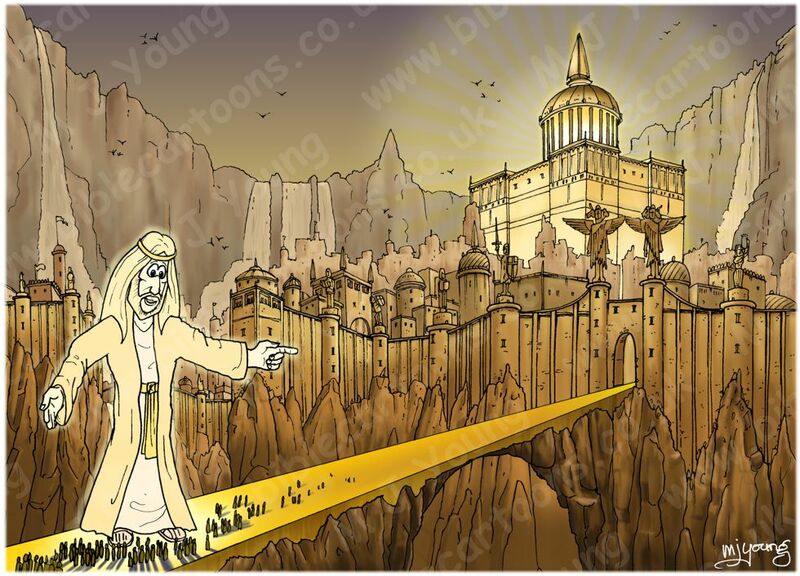 Jesus the Christ, many Christians on the golden road bridge. 01) (This page) Revelation 21 – New Jerusalem – Scene 06 – City & gates [Gold sky]. 02) (Next page) Revelation 21 – New Jerusalem – Scene 06 – City & gates [Blue sky]. The only difference between these versions is the sky colour. This scene was designed for UW Sports, a Christian camp & sports ministry in Colorado, USA. Their brief was to illustrate a heavenly city, with Jesus beckoning people in. I found a particularly striking golden city painting which I really liked, on the internet. I have designed my own architecture & layout of surrounding walls in this scene, but the colour scheme is reminiscent of the picture I found. I wanted the tall Jesus figure to be glowing with divine power, & with arms open to welcome Christians into the city. 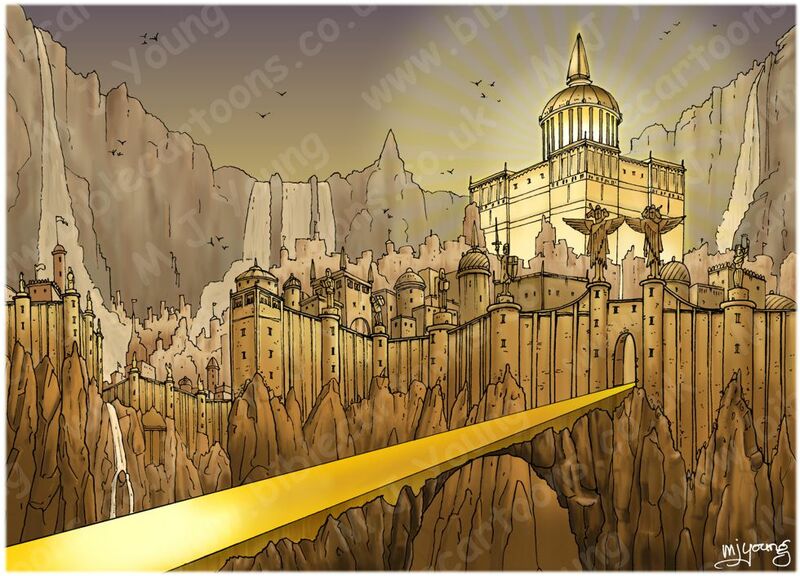 Verse 21 tells us that “…the main street was pure gold, as clear as glass.” You’ll notice that the road into the city is gold coloured for this reason. 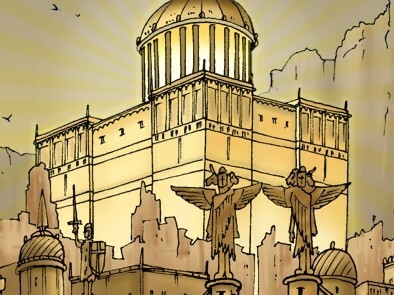 Verse 22 informs us “I saw no temple in the city, for the Lord God Almighty and the Lamb are its temple” so I knew I couldn’t draw a temple-like structure in my scene! 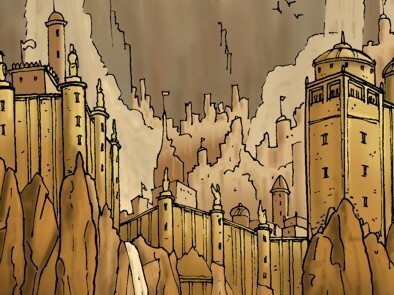 However I decided I needed a second source of light, bathing the whole city in its golden glow, which you can see is coming from within the large palace-like building, in the heart of the city. Here’s the city without the figures. 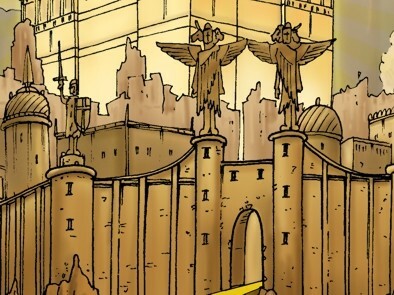 Here’s a close-up of the cherubim statues that stand guard over the entrance to the heavenly city. Here’s a close-up of some of the city which is obscured by Jesus in the finished picture. Here’s a close-up of the palace-like central building.